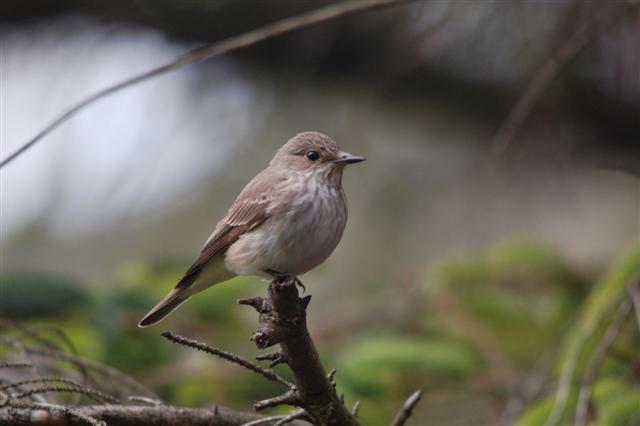 Spotted Flycatcher is a regular localised-breeding summer visitor on Arran. It breeds in most of Europe and western Asia, and is migratory, wintering in Africa and south western Asia. While population studies indicate a decline by more than half in the last 25 years in parts of its range, here on Arran the distribution of the species seems to be stable. It is one of the latest summer visitors to arrive. This year with the cold spring the first record on Arran was not until the 20 May with most of the birds not arriving until June. Compare this with last year when the first report was 1 May or 2011 when the first report was 21 April. As the name implies this bird catches flying insects. They are designed with that in mind with big eyes and proportionally long wings making them very manoeuvrable in flight. About the size of a sparrow with their grey-browns and faint dotted lines, first impression is of a dull bird but their mastery of the aerial hunt makes them a fascinating bird to watch. They commandeer a look-out position such as an exposed branch or a fence post. Sitting upright, flicking the tail and watching for insects, they launch themselves with speed and agility almost beyond comprehension, snapping their perfect, fly-catching bill shut like a trap before looping back, often to their favoured look-out position. Where to look for them? Their preferred breeding areas are mature deciduous or mixed woodland with open clearings or glades but they can also be found in farmland with a scattering of trees, copses, hedges with mature hedgerow trees, often near rivers or burns. They also breed around farmyards and gardens. Places where there are lots of flying insects. Look for them on raised perches on mature trees, telephone wires or fence posts which give them a clear view and give you an opportunity to enjoy their aerial hunting. At the end of August, Spotted Flycatcher depart to their wintering grounds in tropical Africa, south of the equator. Typical lifespan is two years and the longest recorded is seven years and ten months.